Shop for authentic Montana Flags. We offer indoor and outdoor Montana flags in durable nylon. Our outdoor flags are finished with a canvas heading, while indoor flags are finished with a lined pole hem and your choice of with or without fringe. We also offer indoor and outdoor Montana flag sets. 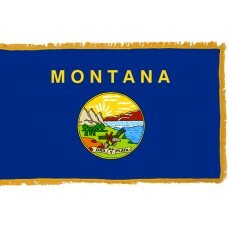 The Montana State Flag features a blue field with the Seal of Montana in the center. Above the Seal "Montana" is written. The Seal of Montana features a plow, shovel and pick in a field in front of the Great Falls of the Missouri River, a sun setting behind the snowy mountains, and a ribbon at the bottom of the seal with the state motto "Oro Y Plata" which translates as "Gold and Silver." The plow, shovel, and pick represent the importance of the agriculture in Montana. The state motto written in Spanish represent the early Spanish influence on the state as well as representing the gold and the silver deposits that were found in the mountains and the states fortune. 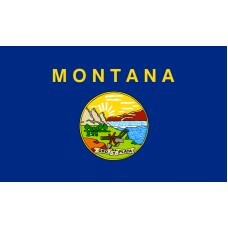 The Montana State Flag was adopted on July 1st, 1981. Montana is one of the nine mountainous states in the Northwestern region of the United States of America. It shares borders with four American States, which are, Wyoming, Idaho, North Dakota, and South Dakota and three Canadian provinces which are British Columbia, Alberta, and Saskatchewan. It is the only state that shares borders with three Canadian provinces. Montana is the 4th largest state and is the largest landlocked state in the United States of America. The capital city of Montana is called Helena and the largest city is called Billings. Montana's name is derived from the Spanish word for "mountain." Montana is referred to as "The Treasure State" due to the rich mineral reserves that it is home to and the gold and silver. It is also known as "Richest hill on planet earth' due to its mining history. The first people that inhabited Montana were known as the Paleo-Indians. Montana was then inhabited with Native American tribes that included Blackfeet, Shoshone, Crow, Cheyenne, Kootenai, and Salish. During the 1700s, European fur traders arrived in the area and trading posts were established. The land was claimed by both the French and the Spanish. In 1803, Montana became a territory of the United States of America following the Louisiana purchase. In 1804, American explorers Lewis and Clark travelled to the area and reported of the beautiful land that they had found and the abundance of fur and people (trappers and missionaries) began to move there. By 1846, Fort Benton was established by the American Fur Trading Company. In 1858, gold was discovered in Montana, and, as a result, more people began to move to the area searching for this gold. As more settlers were arriving to Montana, the Native American tribes were losing their land and hoes and in the 1870s, they began to oppose and fight back, which led to the 1876 "Battle of Little Big Horn" which was the battle between the United States of America army and the Indian tribes. The battle occurred on the 25th June – 26th June 1876 and the Indian tribes were led by famous chiefs that included Sitting Bull, Crazy Horse, Chief Gall, Lame White Man, and Two Moon. The United States of America army was led by George Custer who led 650 soldiers. George Custer prepared to battle with hundreds of tribe members, and did not realize that there were actually thousands of them. George Custer and his men were all killed, and the battle is also known as "Custer's Last Stand." Montana became the official 41st state of the United States of America on November 8th, 1889. "Big Sky Country", "The Treasure State"